Natasha Harding says she was disappointed she missed out on the Wales women captaincy but is delighted to have been named vice-captain. Wales boss Jayne Ludlow succeeded Jarmo Matikainen and in the squad she named in February left out captain Jess Fishlock, with Sophie Ingle taking the armband. "It [the vice-captaincy] is a massive honour," forward Harding said. "I was quick to say to Jayne how disappointed I was not to be captain." 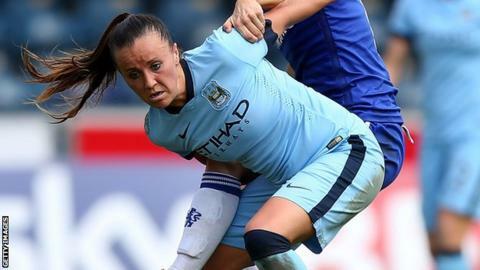 New Manchester City women signing Harding added: "That's just the type of person I am. She knows that I'd be the same person whether I was vice-captain, captain or just a player. "But we all have our important roles and I'm fortunate enough to have that role in the team." Wales women missed out on a place at the 2015 Women's World Cup but begin their Euro 2017 qualifying campaign on 22 September away to Austria. Norway, Israel and Kazakhstan are the other sides in Group 8 standing between Wales and a place in the finals in the Netherlands. Ingle and Harding were captain and vice captain for a March friendly tournament in Croatia and two matches against Slovakia in April. Ludlow is expected to name her next squad for the match against Austria in late August, with Harding hoping Wales can go a step better than they did in narrowly missing out on World Cup qualification. "Last year was a step too far for the girls; Ukraine showed their experience and how they've reached the top and a major championships," Harding said. "Things like that will come for us and I think that under Jayne we have a way of playing. "Everyone is getting fitter - not all the girls are fortunate enough to be [full-time] professionals and there's probably only me, Jess Fishlock and Sarah Wiltshire that are professional at the minute. "Jayne's tried to change our weekly sessions for the girls and [from] what I've seen they're working hard and who knows, Jayne is the one that will take us to the European Championships."